Tonight I'm trying to review Mongozo Banana. This is one of those reviews that has taken me forever to write because it sounds stupid everytime I try and write it; so forgive me if it still does. For a fruit beer the appearance of Mongozo Banana looks startlingly similar to what many people consider a beer to look like. The colour is maybe a bit light, in the flesh it looks even more like urine than it does in the picture! The head is off-white but of an excellent size for a fruit beer, it also has excellent retention and even a hint of lacing. The aroma of Mongozo Banana leaves you in absolutely no doubt as to the fruit subject of this beer. It's chock full of banana! There really is very little else on the nose. The beer smells remarkably similar to those banana musk lollies. Once that realization hit me it was hard for me to get anything else out of my head, maybe if you've had this beer you could share your thoughts on the nose with me. Mongozo Banana has more to it than the nose would indicate. Yes there is still plenty of fake banana sweetness but there is also some hop bitterness to start with. The carbonation is quite spritzy and the mouthfeel is about right for the style. If you like those banana lollies or banana Paddlepops this is the beer for you! I wasn't wrong that I thought this beer might be a little sweet. Thankfully though it's not disgustingly over the top sweet. The banana flavour comes through nicely although it is not a natural banana flavour, it's clearly chemically designed. It tastes remarkably similar to a banana icecream except it's in beer form which can only make it better. Right? 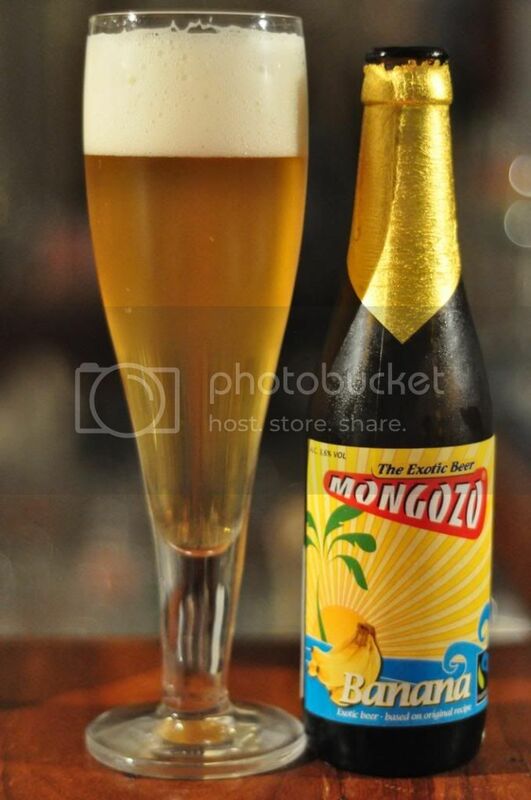 Mongozo Banana is not a world beating beer but is worth a shot if you are interested in finding out what a banana beer tastes like.